22ple is adding another coating to their product line this year. The brand new coating called 22ple HPC will be joining the already excellent VX PRO2 and VX3 Signature which were released earlier this year to replace the original formulas that have been on the market. 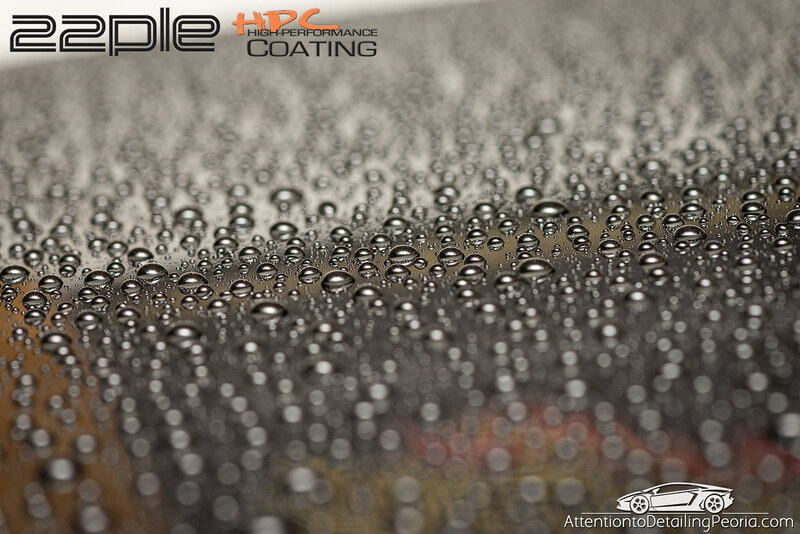 HPC stands for High Performance Coating and is another great step forward in the coating industry. 22ple focused on new materials to make this glass coat even easier to use while producing a very wet gloss and a very hydrophobic surface. This new coating utilizes a unique powdered silica along with a more traditional liquid silica. 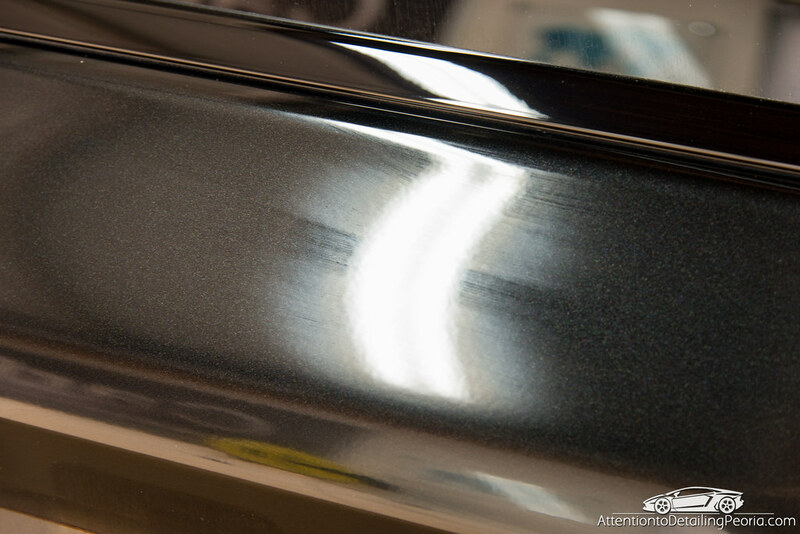 This premium material helps to produce an even glossier finish, and also allows the coating to have a unique trait during application which will be highlighted later in the article. A high grade fluorine was also added to the mix to enhance water repellent behavior. 22ple is the first to combine these innovative ingredients into their products in an effort to push the performance of their coatings to an even higher level. This showcases their expertise and passion in crafting world class paint coatings. 22ple glass coatings are known for their ease of use, high gloss, and excellent performance. Staying true to their reputation, 22ple made sure HPC is extremely easy to work with. Before applying, ensure the paint has been properly cleaned and polished to remove any contamination and surface defects. Wipe the paint down with a 50% alcohol solution to ensure there are no residual oils on the surface. Shake the product well before application. Spread the coating onto the paint using an applicator such as the 22ple applicator or cquartz applicator block & suede. The coating will appear wet immediately after application. Unlike many other coatings, 22ple HPC gives you a clear indication that it is ready to be wiped away. The powdered silica in the coating will dry to a light haze after approximately 3 minutes. This may be similar to what you are used to seeing with a wax or sealant. This haze provides the user with clear feedback that the coating is ready to be wiped away. It is important to note that this time may vary depending on your ambient temperature and humidity. The product wipes away easily using a clean microfiber towel. I prefer to use two towels when wiping away any coating. The first is used to wipe away the majority of the residue, and the second is used to make a final pass to ensure the panel is perfectly clean. As expected, the end result is nothing short of stunning. The perfectly polished paint topped with 22ple HPC produces a strikingly glossy finish with mile deep reflections. HPC provides an estimated 3-4 years of durable protection for your vehicle. The product can be layered for additional gloss and thickness (2-3 layers recommended by the manufacturer – Apply layers 12 hours apart). Allow the coating to set for a minimum of 2 hours, then apply 22ple VS1 Final Coat for additional protection if you desire. 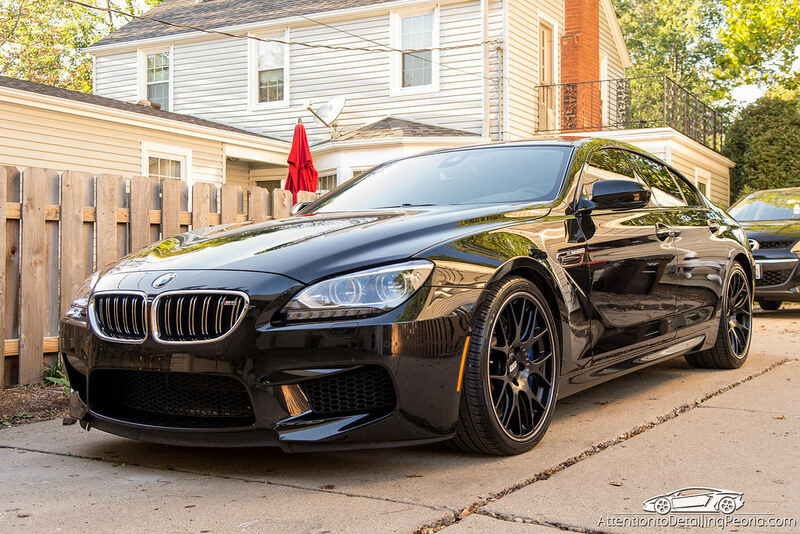 The M6 Gran Coupe shown above was simply coated with 1 layer of HPC when this photo was taken. I look forward to experimenting more with this coating. I have been very pleased with the latest products from 22ple and am sure this one will live up to the already high standards set by VX3 and PRO2. Thanks Zach. Could you compare this to the VXPro2 and VX3 Signature? Obviously, based on price, it’s positioned between the two, but what are some advantages/disadvantages between the three? For multiple years of protection, the price difference seems pretty minimal to me. 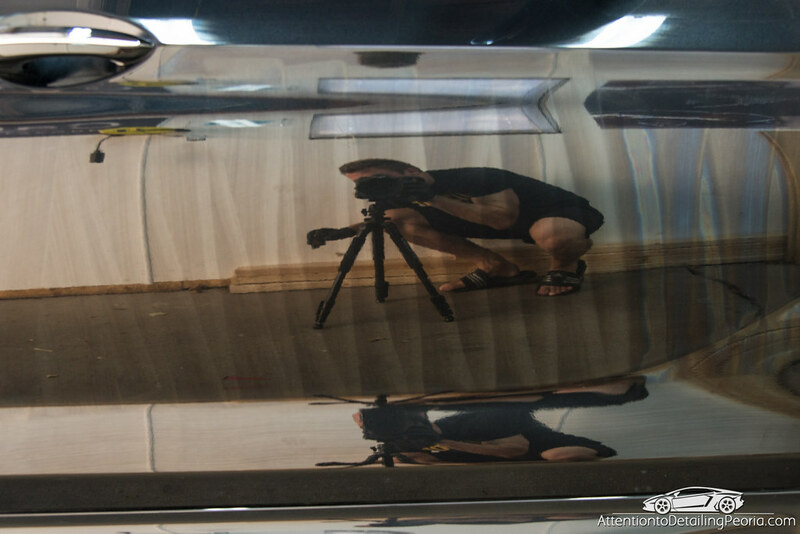 I’ll give you my honest opinion – most vehicles will benefit from an extensive detail including deep cleaning, decontamination, and polishing to remove light defects and restore clarity and gloss every 2-3 years. 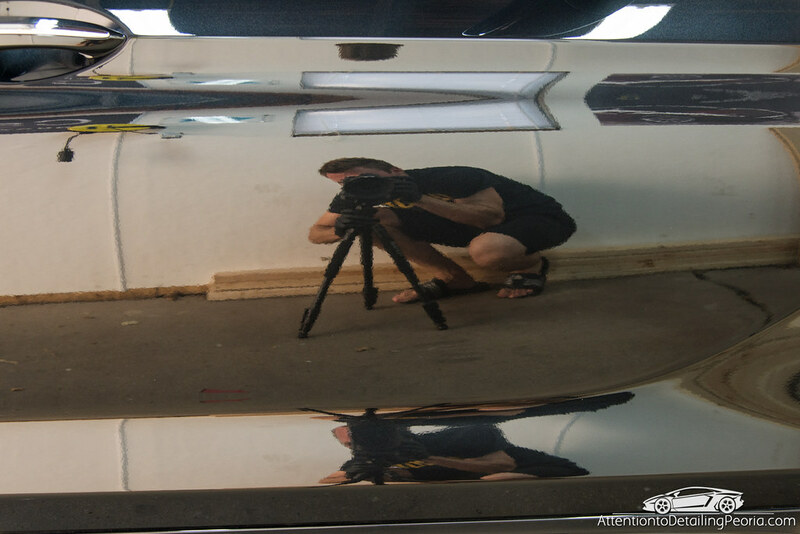 The polishing process will degrade or remove the existing coating, and therefore a new layer will need to be applied, so to me, the first 1-3 years of life is the most important with any coating. Thanks Zach. Definitely looking forward to an in-depth article, but this was a great quick rundown. Thanks, Brien! I’ll be sure to follow up after I have some long term experience with this product. I really like the way the coating hazes to let you know when it’s time to buff off. Also seems to make it harder to miss any spots, but concerning the water repellency… Are you familiar enough with something like GTechniq EXO or CQuarts that advertises >=110* water angle to compare it to? I personally have EXO as my final coating and my beads appeared to sit a little taller than your picture when I first applied it. ~15k miles later the “higher wear” portions of my car are starting to lose the effect and the beads sit a little flatter and don’t sheet as quickly. Just curious to know how this compares to something like that initially. The beading picture was actually just taken a couple days ago on my personal vehicle where I am testing HPC on one panel. The vehicle was quite dirty when it was raining, so that will diminish the roundness of the beads some, however even when the car is dirty, the water will roll off of the panel with ease while driving. We are authorized CQuartz Finest installers, and have used all other CarPro coatings in the past and are quite familiar with their beading characteristics. In fact, I have one panel on my car which is split into 3 sections and has 3 different coatings applied to it. The beads of CQuartz Finest are slightly rounder than the two 22ple coatings, however there is no noticeable difference in sheeting or resistance to slide off of the surface while blow drying. I will monitor HPC further throughout the winter, and I imagine that after a thorough cleaning the beads will be rounder than what was captured in the photo. Thanks for the response. I assumed this was taken after the curing time on a still clean vehicle. I see the same effect on my car. When it gets dirty, the “ants” march a little slower up my hood and windshield in the rain. Nope, just my daily driven dirty car 🙂 I’ll be putting HPC (and other coatings) to the test as the car will likely not see much proper washing throughout the winter depending on the weather. On the EXO have you tried using C2v3 mixed 20:1 with distilled water for maintenance. Should bring the tight beading back. I do this every 4-6 months. Thanks Zach for the information. A win/win for all of us as technology and chemistry gets even better in the field. The hazing is a great idea for us hobbyists. I know you’re using Carpro Essence, is HPC gonna be compatible with that product, as Essence is Si02 and 22ple is Si02, but have you done any personal testing with the HPC line or other coatings to see if they’re compatible? Hi Tim – I am currently testing 22ple coatings on top of Essence. I have been experimenting on my own car, and so far I have seen nothing that would indicate that 22ple products will not work on top of Essence, but it has only been a month or so…. I will monitor my test panels on my personal vehicle throughout the winter to be certain. CarPro states that Essence should theoretically play well with other coatings, but they haven’t done any testing on their own. I was thinking about using Essence and topping with 22PLE HPC. What results did you conclude if any and how is your coating holding up? Hi Tom – I no longer have the vehicle that I was using for my previously mentioned tests, but as I had stated initially, I saw no signs that Essence was causing any sort of issues with the coatings. It is important to remember to use Essence properly and to allow enough time for it to cure, or to perform a light Eraser wipedown afterwards just to be safe, prior to applying the coating. I have a 997 911 Cab slate grey metallic. I use a paint sealant base covered by a carnuba surface. It looks shine. Is the product you described ok to use for weekend warriors like me? Would it look as anymore shiny than it is now? Paint coatings can be used by anyone who is familiar with the complete detailing process. even with these coatings on it. I have 2 vehicles with the coatings, and I am wondering what to do for maintenance come spring. Hey Rick, it is important to keep the paint as clean as possible throughout the winter. Check out Ivan’s article on winter washing with ONR for a great way to keep the car clean. Come spring time, simply resume with your traditional cleaning. Wash with a shampoo like CarPro Reset using the 3 bucket wash method. You may find that the paint needs to be decontaminated from time to time, IronX typically does the trick, but an ultra fine clay may also be needed. I also prefer to use a coating topper like 22ple VS1 Final Coat from time to time to promote a slicker surface, even more gloss, and to revive hydrophobic properties if needed. I have been using ONR for a while now. The only one I use. One question. You polished, erased and are ready for the coating. which one would you use for toughness and scratch resistant????? I have used the Opti-coat and Opti-gloss. I would like one that is more scratch resistant. As always, thank you for your expertise and knowledge. Happy Holidays. Hi Rick – my very honest answer is that if scratch resistance is your biggest concern, a coating will not provide that for you. Wrap the car in clear bra. I am always testing various coatings on my own vehicles, and while the chemistry does indicate that surface hardness may be increased some after the coating has cured, it is never going to make a major difference compared to bare paint. A coating is meant to provide some protection against environmental contamination, and in my opinion shouldn’t be expected to provide scratch protection of any kind. Hope that helps! Thanks for reading. When applying this product, how many of the carpro suede cloths did you use? Also, for the microfiber cloths used to buff off the excess HPC did you end up throwing those microfibers away or did you dunk them into APC and reuse them? I used 2 suede applicators (you can use the front and back of each). We wash the towels afterwards and always inspect them before using them again. With the 50 ml bottle, could I possibly get through 2 -3 full size SUVs and or sedans by doing all the paint surfaces, rim face, windows, and door jams? I would purchase 2 large bottles. If you have extra, you could apply additional coats. Almighty fantastic! Thanks for all the help, decided to go with 22ple HPC, my order should be coming in today. Really helped me with any doubts and questions. Hi John – 22ple recommends multiple coats for maximum gloss and protection, however in my testing & review I just used one coat and that still performed great! Hi Tony – there are many paint coating products on the market from many different manufacturers, and they all have different application processes. Some of them can be quite difficult to apply, but provide a stronger coat once cured. Those are typically reserved for professional, authorized installers. Most consumer grade coatings focus on ease of use so that anyone can do it if the directions are followed. 22ple focuses on making their products very user friendly! The biggest challenge is doing the prep work… the vehicle must be thoroughly cleaned, decontaminated, paint corrected (or at least machine polished), wiped with alcohol, and then the coating may be applied. Let me know if you have any other questions. Thanks for reading! At my shop,I am using Mistico Element by 22ple because it is supposed to be there professional grade product. How do these two products compare? Ken – as you likely already know because you’re an authorized installer of ME, it is a purely silica based coating. 22ple HPC contains other ingredients that make application and performance vary. All 22ple products have varying formulas, application processes, and performance to some degree. Just recently gave the 22ple HPC a shot and have to say pretty darn impressed initially. Application and removal was the easiest of any coating I have used (Cquartz, WG Uber, Gtechniq CSL, Kamikaze, Pearl Nano, Gloss Shop, Gyeon MOHS) and the gloss is just incredible. Curious as to if you have any thoughts on long term durability of the HPC? Glad you liked it! I agree it is very simple to install, which is a huge plus! I tested HPC on my personal vehicle for about a year before I polished the panel and coated it with something else to test. Throughout the time I was evaluating HPC, it performed perfectly. I cannot speak to the durability past the time I had tested it, though I can assume that with proper maintenance it should perform very well for quite some time. Thanks for the info Zach. Gyeon Cure, Pearl Nano, The Gloss Shop Ceramic Coating, Gtechniq Crystal Serum Light + Liquid Crystal C2V3, 22ple HPC + VS1 Final Coat. Given the ease of application and the incredible glossy final appearance, the 22ple stands out from the others by a considerable margin, at least at this initial stage…I hope it has the ‘legs to last’ as that will be a winner in anyone’s book. Even after driving thru last weeks sudden winter snowstorm (with it’s attendant salt, brine and anti-icing agents dropped all over the road) from 10ft the thing looks like it was just washed. I surprised this isn’t a more popular choice and more widely used. It’s just as easy to apply as a sealant. Good stuff. I absolutely agree with you. 22ple is a highly under appreciated brand, but they are a small company and really don’t do any marketing. If they can work to build a bigger market in the US and lower their product costs a bit I could imagine they would have a much larger following. It’s a shame as I really thanks it’s a hidden gem. Supposed to be releasing something called Finitura sometime, a stronger VS1Final Coat kinda thing I guess. Yup – I tested some concepts of that product last year. If the final release is as nice as what I was testing it should be a nice addition to their product line. Very glossy and easy to use. Hi Zach, Do you think one bottle of 50 ml will be enough for 2-3 layers on a chevy silverado 1500? It is a brand new truck 150 miles but it has imperfections already, I guess by the dealer doing his washes on the lot, I will correct them but my question is should I just compound the truck and then apply the coating or I should polish after compound and then apply the coating, what do you Think? FWIW, no pro here but have used the 22ple HPC on a variety of vehicles. First off, yep…I would polish after compounding (or try something like Menz 2400 or Sonax Perfect Finish and maybe only have to do 1 step if it finishes LSP ready). The 22ple is very high gloss so you’d want the paint as good as you can reasonably get it before application. That said, I got 2 coats on a Ford E250 van (except for roof) out of a 50ml bottle with a tiny bit to spare. I would think it’s *possible* to get 2 coats on your vehicle with 50ml, but almost certainly not 3. Thank you for your reply Jon, I am correcting with Menzerna FG 400, wipe down with IPA and the coating. I would think 3 coats would be a stretch on a vehicle that size. 2 for sure, but I would be surprised if you got 3 good coats. With that being said, 2 is plenty in my opinion. As far as the correction work goes, always start with the least aggressive method and work your way up as needed. I would not start with compounding, start with a light to medium polish and see if you can remove the imperfections that exist. If you have to use a compound, and the compounding process leaves marring, then you absolutely need to polish the vehicle. If no marring is present and the finish looks perfect, there may be no reason to polish the vehicle at that point. It just depends on the severity of the defects and how your paint reacts to the correction work. Hey Zach, great review! I know this is an old review but was wondering if you still like using this coating? Can you compare this to maybe Gyeon Mohs or Gloss Coat? How is the durability, bearing for this HPC??? I’m trying to decide on a coating before winter. I like the Gloss Coat but don’t like their supporting products as their supporting products don’t bead water like other topping sprays. Again, not a pro but have used both Gyeon Mohs and 22ple HPC on a few vehicles. Both vehicles are only about 7 months into application (and have rec’d no washing since application except for rain showers) and both stay remarkably clean, with the 22ple HPC having an edge in beading and outright gloss and both stay remarkably clean. Although I have no scientific evidence to back it up, to me the Mohs seems to be a little ‘harder’ than the 22Ple; Mohs has somewhat of a reputation as a good choice for daily drivers due to it’s hardness/durability although if beading is important to you, the HPC seems to have an edge on neglected vehicles. Have never used Gloss Coat but I can’t believe it would outperform these two because they’ve just done so well on these vehicles with little to no post-application care (I tested about 10 coatings last winter on Fleet Vehicles at work). I had used some of the other 22 ple products before but never this HP, this a brand new truck that is going to be my daily driver, I check the truck very well at the dealer and with 150 miles already has a lot of swirls marks, I guess from their lot washes. I’ve been pleased with the 22ple line before I dont think this is going to be the exception. I have not used Gyeon Mohs yet, though it is on my list of things to do whenever I find the time. I absolutely love HPC. It is perhaps the most user friendly coating I have ever used in terms of application, and the results are outstanding. The durability for either coating will be great, and the hydrophobic properties will depend greatly on several environmental factors. Remember – water beading does NOT equal protection. Your coating will eventually lose its water beading abilities, but that does not mean the coating has failed, it simply means the surface tension has been altered. This is why coating toppers such as 22ple VS1, Gyeon Cure, CarPro Reload, and GTechniq C2 exist. They increase the surface tension and help boost protection.